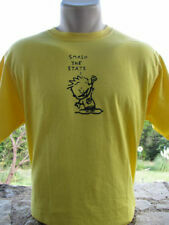 The reason Calvin and I want to smash the state is because it is the most destructive entity on earth. I use the term “state” in the economic sense (not the state of Iowa, although it is not excluded). The state refers to anything that is exempt from rules that create an orderly society. This comes up because I am not allowed to act as if I own the deer on my property. Therefore they are not mine. Whose are they? Well, if I want to use one I must ask the state for permission. The state owns the deer. If you run into me with your car you are liable for the damage caused. The state’s deer ran out in front of our beloved CR-V and caused $6,450 worth of damage. I didn’t bother to try to get reimbursed because the State can legally act like a criminal. Then today I found that after several years tending to four larch trees that Karl brought from Wisconsin, two of them have been torn up by the state’s deer. Karl knew they were my favorite species of tree. In Northwest Montana where I used to live, they were harvested as lumber similar to Douglas fir. There were some old growth that were killed in the 1910 fire. They were still standing with no bark and made excellent firewood. The branches were tiny and they stood like a 100 foot hot dog ready to be sliced up. Go ahead, name something the state does that can’t be done more efficiently by people who are guided by moral principle. If you want deer, get some land and a fence and keep them to yourself. Don’t expect me to love something that worthless. I have a fondness for the desert tortoise in Nevada. But the state keeps moving the tortoise’s habitat to make room for more solar panel arrays – Harry Reid makes a bundle via kickbacks every time a new array goes=-up and the taxpayers pay for the habitat re-locations. But hey, I’m quite sure that Nevada residents benefit from the much lower costs of solar electricity — when it operates, that is. Actually, it probably costs less for the electricity when the solar arrays don’t operate.